Do you believe in giving back to the community? Do you enjoy working with seniors? Volunteer with Self-Help for the Elderly! We host many events throughout the year and have many programs with activities everyday, so we love getting help from volunteers! Many of our volunteers love being a part of what we do, they always end up coming back to volunteer! Volunteers help at special events, provide direct service to our programs or our seniors, or come in on a day-by-day basis. If you work during the day but still want to volunteer with Self-Help, we have many weekend or evening opportunities to participate in. If you would like to directly work with seniors or volunteer on a regular basis, we can assign you to a program that aligns with your interests. 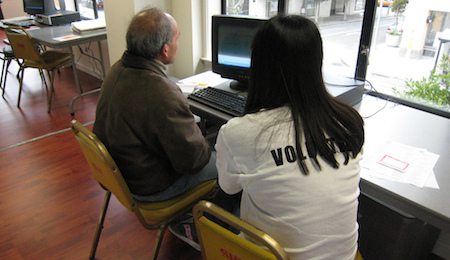 Some volunteer opportunities include working at a senior center, general office work, data entry, tutoring, or staffing a phone line. If you would like to be on an on-call basis, you can volunteer for short-term projects as well. We will do our best to place you in an area that you are excited about! If you would like to volunteer with Self-Help for the Elderly, we would love to have you! Reach out to our volunteer coordinator at 415-677-7600 for more information.